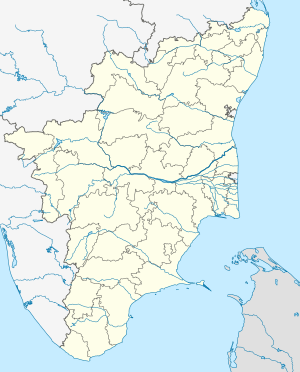 Sengottai railway station is a railway station serving the town of Sengottai in Tamil Nadu, India. The railway station is located off the Railway Station Rd, Viswanathapuram of Sengottai. The nearest bus depot is located in Sengottai while the nearest airport is situated 110 kilometres (68 mi) away in Thiruvananthapuram. The station is a focal point of the historic main line that connects Chennai with places like Madurai, Villupuram, Tenkasi, Rameswaram etc. ^ "Sengottai Railway Station". Mustseeindia. Retrieved 13 July 2013. ^ "Kollam-Sengottai train service likely from May". The Hindu. Kozhikode. 21 December 2016. Retrieved 29 May 2018.